A memorial at the site of the battle. The Battle of Callann was fought in August 1261 between the Hiberno-Normans, under John FitzGerald, and the Gaelic tribal forces of Fínghin Mac Carthaigh, King of Desmond, ancestor of the MacCarthy Reagh dynasty. It took place in the townland of Callan or Collon near modern-day Kilgarvan, County Kerry. MacCarthaigh was victorious. All of the following excerpts were taken from the University College of Cork's Corpus of Electronic Texts (CELT), which can be found online. 1261.5	Very destructive war was waged against the Galls this year by Fingen son of Domnall Mac Carthaig and his kinsmen. 1261.6	A great hosting was made by the Fitz Geralds into Desmond, to attack Mac Carthaig; but he attacked them and routed them and fitz Thomas, John by name, and his son killed there, as well as fifteen knights, besides eight noble barons and many young squires and countless soldiery. He killed Barrach Mor (Barry More) also. Afterwards Fingen Mac Carthaig was killed by the Galls and the kingship of Desmond was assumed by his brother, the Ex-cleric Mac Carthaig. 1261.4	John fitz (son of) Thomas and the Barrymore were killed by Finghin Mag Carrthaigh and by the Desmonians likewise and a large number of other Foreigners were killed. 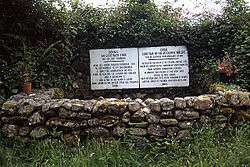 1261.5	Finghin Mac Carrthaigh was killed by the Foreigners. 1261.5 A great war was waged, and many injuries were inflicted, by Fineen Mac Carthy, son of Donnell Mac Carthy, and his brothers, on the English. 1261.6	A great army was marched by the Clann-Gerald Geraldines into Desmond, to attack Mac Carthy, i.e. Fineen. Mac Carthy attacked and defeated them; and in this contest were slain eight barons and five knights, besides others of the English nobles, as also John son of Thomas and Barry More. Countless numbers of the English common soldiers were also killed in the aforesaid battle. 1261.7	Fineen Mac Carthy was afterwards killed by the English, and the lordship of Desmond was assumed by his brother, the Aithcleireach Mac Carthy. 1261.4 A great war was waged, and numerous injuries were committed, by Finghin, son of Domhnall Mac Carthaigh, and his brothers, against Foreigners in this year. 1261.5	A great hosting by the Clann-Gerald into Des-Mumha, to attack Mac Carthaigh; and Mac Carthaigh attacked them, and defeated them, and John son of Thomas, and his son (Maurice son of John), and fifteen knights and eight noble barons along with them, were slain there, besides several young men, and soldiers innumerable. And the Barrach Mór was also killed there. Finghin Mac Carthaigh was subsequently slain by the Foreigners, and the sovereignty of Des-Mumha was assumed after him by his brother, i.e. the Aithchleirech Mac Carthaigh.